Brief synopsis of Viggo's virtues, with a few quotes and a nice photo. Poll "Who's Hotter?" 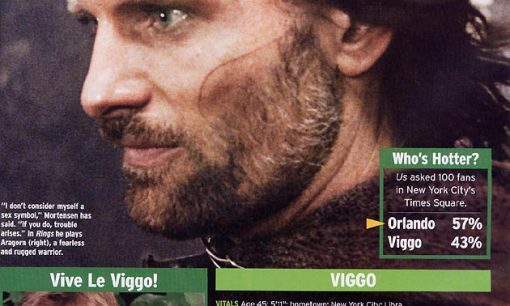 indicates that Orlando won over Viggo 57% to 42%. Obviously they weren't asking us. Favorite quote from Viggo: "As long as I have Orlando around, I can sneak away. The girls will go for him every time."